Mortgage Market Guide: Big Headlines. Little Movement. Last Week in Review: Stock and Bond markets were quiet in the lead up to the Fed meeting June 13-14. Forecast for the Week: Monetary policy and a broad spectrum of economic data will dominate. View: A canned email response to extinguish conflict. “Well, it’s been a quiet week in Lake Wobegon, Minnesota, my hometown.” Garrison Keillor. Despite big headline events at home and abroad this week, Stock and Bond markets were relatively quiet. Former FBI Director James Comey testified before the Senate Intelligence Committee. And residents of the United Kingdom went to the polls in a snap general election as the U.K. unravels its relationship with the European Union. These were big events that didn’t really move markets. Perhaps this signals a calm before the storm heading into the June 13-14 Federal Open Market Committee meeting where expectations are that the Fed will raise its benchmark Fed Funds Rate another 0.25 percent to a range of 1.0 to 1.25 percent. This is the rate banks lend to one another overnight, and it does not directly impact long-term rates like home loan rates. In housing news, home prices continued to surge in April. 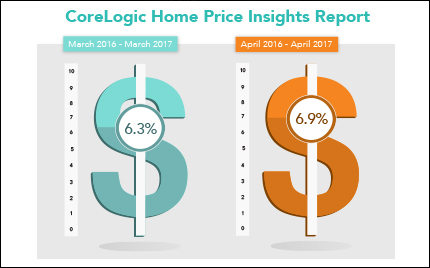 Data analytics firm CoreLogic reported that home prices, including distressed sales, rose 6.9 percent from April 2016 to April 2017. Month over month, prices were up 1.6 percent from March to April. Looking ahead, CoreLogic sees a 5.1 percent gain from April 2017 to April 2018. Low home loan rates and limited inventory have caused “a bidding frenzy” in some metro markets as “multiple contracts are placed on a single home,” CoreLogic said. At this time, home loan rates remain near seven-month lows. If you or someone you know is in the market for a home or has any questions about home loan rates, please contact me today. I’d be happy to help. Investors will have a lot to unpack in the next week. The Fed‘s monetary policy statement will be released following the Federal Open Market Committee meeting. Data releases will cover a broad spectrum of the U.S. economy. Inflation numbers from the Producer Price Index and Consumer Price Index will be released on Tuesday and Wednesday, respectively. Retail Sales along with the Fed‘s monetary policy statement will be shared Wednesday. Regional manufacturing data will be released Thursday in the Philadelphia Fed Index and Empire State Index. As usual, weekly Initial Jobless Claims also will be available Thursday. On Friday, Housing Starts, Building Permits and the Consumer Sentiment Index will be reported. 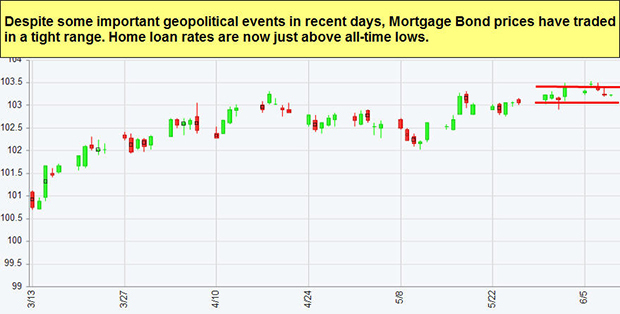 As you can see in the chart below, Mortgage Bonds experienced little movement this week. Home loan rates remain near historic lows. Part 2 of 3One of the quickest ways to streamline your productivity is to automate as many repetitive tasks as possible. And one of the easiest things to automate is found right in your email inbox.Chances are you send a lot of emails that are similar. Rather than retype the same messages over and over, craft a simple canned response for each repetitive communication type. Then, just cut and paste the response or input your saved canned message, lightly editing to suit specific details. I appreciate your feedback as well as your frankness regarding [situation]. I think I understand where you’re coming from and would find it helpful to discuss things further. I’d appreciate an opportunity to talk about where we go from here to avoid miscommunication in the future. Do you have time for a quick call, or better yet, a cup of coffee this week? My treat! Emotions don’t translate well over email, and this response can help show the respect you have for the individual’s feelings and opinions as well as your desire to keep the relationship in good standing. Next week we will share how to use canned emails to help take a pass on low-priority work. Stay tuned!